Another post! I know, I’m surprised too! I’m doing a fun new show and I wanted to tell you guys. Since Harvard Sailing Team has started doing more shows nationwide, and fewer shows in New York City, I knew I wouldn’t last long without another live comedy venture to put my energy into. 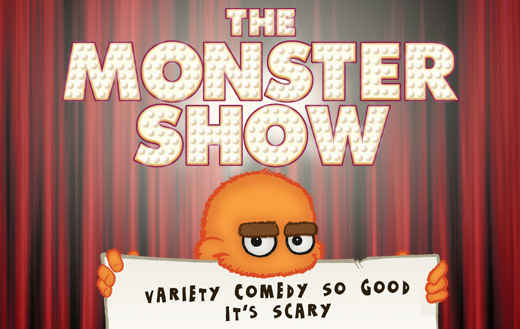 I still perform every Saturday night at the PIT with my improv group The Baldwins, and now I’m also working on a new monthly variety show called The MONSTER Show. Our first show last month was a great success – such a fun crowd, fantastic guests, and my co-hosts Clayton Early and Chris Roberti and I had a blast entertaining everyone. Kevin produced, co-directed and co-wrote the show and that was awesome too. I’m lucky to get to work with such talented, smart people. Our next show is this Friday, November 11 at 9:30pm at the PIT. We have another exciting line-up: the beloved sketch duo Chris & Paul, Last Comic Standing’s Adrienne Iapalucci, Jack Dishel in Only Son (he’s the lead guitarist of The Moldy Peaches and toured with The Strokes and Regina Spektor! ), plus Harvard Sailing Team will appear via Skype from LA! And other fun stuff will happen too. 🙂 I love it. This has been an exciting, interesting year for me. There have certainly been ups and downs, but overall, I feel like a lot of wonderful things have happened this year that have forced me to pause, look around, and feel grateful for what I’ve accomplished. My job at the PIT is fulfilling, I am more at home performing comedy than I ever have been before, I’ve made my health and mental wellness more of a priority than I have in years, and I’m about to turn 31 on Monday. It’s a birthday that’s crept up on me. 30 was such a milestone, and it took a while to get used to the idea that I was no longer a 20-something, I guess I forgot that other ages would follow once 30 was said and done. We’re just doing low-key stuff this year – dinner with friends, a fun day together as a couple, I have to teach on the actual night of my birthday – very…adult, I suppose.